Cell Membrane: The Cell Membrane is selectively permeable which means it only lets certain things in and out. Additionally, it protects the cell from the outside environment. Cytoplasm: The Cytoplasm is a fluid with the same kind of texture as jelly. All the organelles float in it. Everything in your house is surrounded by the air, so in this way the air in your house is like the Cytoplasm. Nucleus: The Nucleus has the recipe of your DNA. It tells the organelles what to do. A cookbook contains recipes and the Nucleus contains the recipe for your DNA. 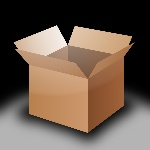 A box is like the Cell Membrane because a box opens and closes and it only lets in the things you put inside it. Ribosomes: Ribosomes perform a process called Protein Synthesis. Ribosomes convert RNA into protein. Rough ER: The Rough ER is rough because there are ribosomes on it. These ribosomes are in charge of collecting proteins. A basket is like the Rough ER because it collects things so they aren't all over the place. Smooth ER: The Smooth ER does not have ribosomes on it. The Smooth ER stores things in the cell like lipids. An oven is like a ribosome because it turns something uncooked into something cooked. Golgi Apparatus: The Golgi Apparatus receives particles and packs them into vesicles to be sent to their location. An elevator is like the Gogli Apparatus because it transports things to places they need to be. Lysosomes: Lysosomes digest things in the cell. They digest things like bacteria and food particles. A dishwasher is like a lysosome because it gets rid of bacteria and food off of the dishes. Vacuole: These organelles are usually found in plant cells. They store nutrients for the cell in case the cell may need it. Chloroplast: Chloroplasts are only found in plant cells. They use the sun's light to create sugars for the cell. Solar panels are like chloroplasts because they use sunlight to make light appear in the house. Cell Wall: The Cell Wall is in plant cells. It protects the cells and has three layers. A wall is like a cell wall because it is thick and keeps things out. A pantry is like a vacuole because it stores food which has nutrients. Mitochondria: The mitochondria is the powerhouse of the cell. It takes in particles and converts it into energy for the cell. Microfilaments: These are part of the cytoskeleton which helps keep the cell's shape. Shoe Shape Holders are like Microfilaments because they keep the shape of the shoe. Microtubules: These are hollow structures also found in the cytoskeleton. Straws are like microtubules because they are hollow and they also can keep the shape of things. An off and on switch is much like the mitochondria because it controls whether something is working or not working. This makes it a powerhouse, like the mitochondria.